Cook fish sticks according to package directions until golden and crispy. While fish is cooking, make the sauce: stir all ingredients together until smooth. For the salsa, stir all ingredients together until evenly mixed. 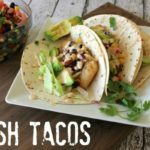 To assemble, place 1 piece of fish onto 1 tortilla and top with salsa, sauce, lettuce and avocado. Serve.